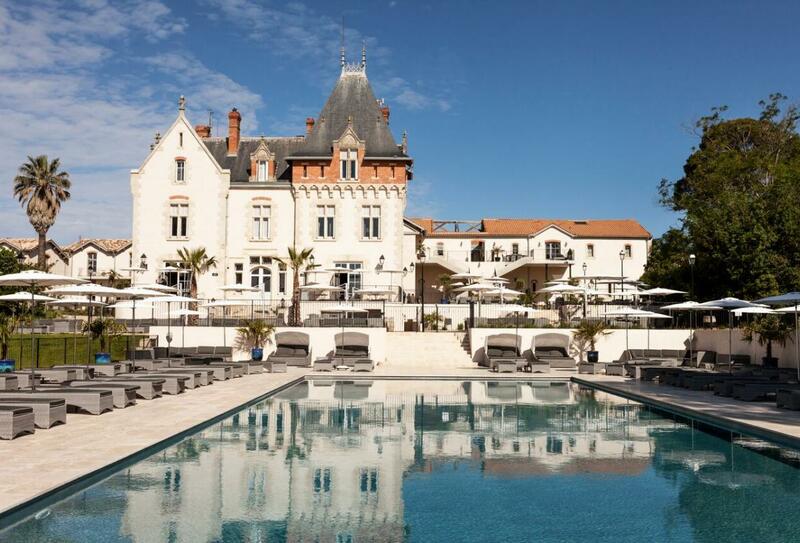 A magnificent Château estate with vineyard, hotel, restaurant, spa and luxury self-catering properties set in 200 acres of beautiful Mediterranean countryside in the Languedoc, South of France. The authenticity of a working wine estate with the facilities of a luxury hotel; hotel rooms and larger self-catering properties; the relaxed-yet-attentive service of a private club. Like the best French wines, this chateau is an ‘assemblage’ – a destination that blends the best aspects of traditional holiday options. Le Four à Pain is the largest property in this magnificent chateau development. Large kitchen / living area with vintage chandeliers and working fireplace with wall to ceiling bay windows lead to a spacious dining terrace and large garden with sweeping views and a 10m infinity pool. This property also has a separate media room which has a proper double sofa bed increasing the capacity to 10. (Extra charge just for the linen for one or two people). The house is set over 3 floors with four spacious bedrooms, all ensuite, with high ceilings and lovely views over the vines or across the estate courtyard. Living space 220m² (2368ft²). Space and independence: 36 luxury self-catering properties carved from the original estate outbuildings, sleeping up to 10 people. Fully equipped, private terraces and gardens, many with private pools. Large heated pool and terrace with oversized loungers, bar service and spectacular views. Masterclay tennis. Spacious gardens with boules and BBQ area. Complimentary bikes with trails for walking, running and biking and a great kids club. Regular wine tastings, farmers markets, concerts & exhibitions frequented by guests and locals. All you need for a great family break: Kids Club with warm, qualified staff and an outdoor agenda. Regular kids dinner parties and movie nights. A huge communal pool. Bikes, sports, swimming, large gardens, trees to climb and an archaeological dig. Toddler friendly accommodation and a panel of reliable babysitters. Free high speed WiFi across the estate. All properties have Bluetooth sound systems as well as late model TV/DVD with a full range of French and English language channels. Complimentary DVD library available from the concierge. 10 acres of gardens and park surrounded by 220 acres of woodland, olive groves and vines, crisscrossed with trails for walking, running and biking. The Masterclay tennis court is Championship size, all equipment provided. Complimentary bikes are available for hire - all terrain & mountain bikes for all sizes. 2 boules courts and communal barbecues for social eating. Le Four à Pain is the largest property at St Pierre de Serjac. Large kitchen / living area with vintage chandeliers and working fireplace with wall to ceiling bay windows lead to a spacious dining terrace and large garden with sweeping views and a 10m infinity pool. Separate TV lounge. ° Linen & towels are changed every 3-4 days. ° Minimum 7 night stay during July & August but flexible start days. In all other months stay-periods are flexible and will be charged per night. Please enquire direct with South France Holiday Villas. ° Pets accepted. 15€ per stay. Security deposit taken by card swipe on arrival. Please Note: Interior photographs shown are of different properties within the same price category. An inviting and sensuous 350m² Mediterranean sanctuary for relaxing and reviving where joie de vivre presides over rigid rules and clinical sensibilities. Huge glass sliding walls which flood the space with sunlight all year round. 12m heated indoor pool with massage jets, hot tub, aromatherapy sauna & hammam. Indoor/outdoor relaxation terrace with great views. A tranquil oasis of Mediterranean flowers, herbs and aromatics dotted with cocoon-like double loungers for one or two.